Haleakala is a simple 2-player game where players try to build statues around this Hawaiian volcano. To score the most points, you will need to build ever closer to the crater, while also ensuring you choose the right side, for the next eruption could reduce your constructions to ash. 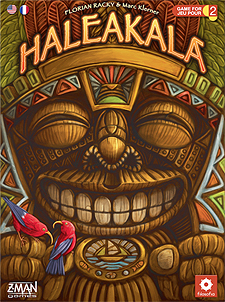 With two ways to play that affect the level of randomness, Haleakala will captivate your imagination with beautiful artwork and high-quality components.